LOS ANGELES—Fast on the heels of its incredibly insightful production of Arrival & Departure, which involved deaf and hard of hearing persons, the courageous Fountain Theatre now presents the West Coast premiere of Martyna Majok’s 2018 Pulitzer Prize-winning Cost of Living. The playwright’s Ironbound recently enjoyed a heralded staging at the Geffen Playhouse in L.A.
Theatre demands conflict and problems, differences and misunderstanding to work—otherwise there’s simply no drama. 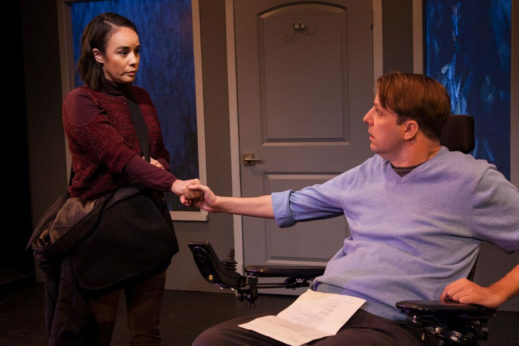 When the human condition also involves characters with physical or mental disabilities, playwrights are sometimes eager to explore what special responses those conditions elicit among the other people on stage. It turns out that though the specifics of the situation are unique, the playwright is ultimately and more universally interested in the way we deal with obstacles and challenges, what drives us to act the way we do, and the way our personality expresses itself. More and more, in the arts and even in advertising, we see persons with disabilities not as objects of pity but as active agents in and for their own lives. In the zero-sum Monopoly game that is austerity capitalism today, the system closes off avenues of opportunity and fulfillment as too expensive—those ol’ debbil “pre-existing conditions” which were so damaging to Republicans in the recent midterm elections. In any decent society that I might envision—and possibly this was on a lot of voters’ minds too—especially one with an infrastructure and economy so highly developed as we have in the United States, there would be virtually no limits placed on care and training for people at all levels of ability. For such a society to thrive there is no place for thinking about dispensable, disposable people. In part her worldview has been shaped by her personal history as an immigrant from Poland. She and her mother undoubtedly expected more from America than what they got. Only by dint of extraordinary personal sacrifices and dedication to her craft as a writer did Majok emerge over time as one of our country’s leading contemporary playwrights. But that’s the problem with meritocracy: It works great for those with exceptional gifts, or perhaps we should say, gifts that are recognized as valuable commodities in the marketplace. For others, who may be excellent car repair specialists, or tool-and-die workers, school cafeteria servers, hotel employees or maybe just warm, loving parents, life is often a hard slog from cradle to grave. In a just world, it shouldn’t have to be that way. I think that’s what Majok is trying to tell us. Here’s the set-up. There are two pairings of people, who alternate in scenes depicting phases of their relationship. John (Tobias Forrest) has cerebral palsy and uses a wheelchair. A young man of some economic means, he lives independently, and is pursuing grad school, but depends on home care assistance for basic grooming needs and “whatever I need, within reason.” His new employee Jess (Xochitl Romero) is an immigrant from Latin America and a Princeton graduate, but for reasons that are not apparent, she is not employed in her field, perhaps owing to psychological or emotional insecurity. So she is applying for the position as his home care worker. Among her other jobs, she also works in a couple of late-night bars for income. “I sleep for fun,” she says. Their wary verbal sparring is so well written. The other couple includes the lusty, potty-mouthed Ani (Katy Sullivan), who is a wheelchair-using quadriplegic in need of much more constant attention. Her caregiver is her former husband Eddie (Felix Solis), a Latino and long-haul truck driver presently not working who desperately needs both an income and a place to live. Sharing a home with Ani would resolve both of those issues, although there is much prickly baggage to overcome—and also a deep reservoir of love for one another that yearns to be expressed. Where did her characters come from? In a statement in the program she says they “came to me incrementally over a year. They’re all composites of people I know or have been, aspects of what I was feeling that year. I have been employed in the work that Jess does in the play and, yes, I have people in my life with disabilities. But I did not set out to write a play about disability. I wrote a play about class and loneliness and the journey towards connection with other human beings in America—that happens to also feature two disabled characters…. Perhaps more than anything, Cost of Living examines the human need for one another, and what we do to get what that need demands of us. In a 2017 interview with Stage Buddy, Majok said, “I think sometimes in trying to protect ourselves—from being hurt, from being taken advantage of, from acknowledging the consequences of some of our own choices—that we can move away from people when perhaps we should be moving towards.” One of the issues here, and not only for those with disabilities, is our lovability. Are our lovable years finished and must we move on to bitterness? John Vreeke’s direction is flawless, especially considering that two wheelchairs are involved, as well as a couple of scenes of personal grooming that are handled with humor, discretion, a notable absence of sentimentality, and a splash of eroticism. The play is cast with actors with disabilities who have both achieved remarkable heights—in Sullivan’s case also as a competitive athlete. The acting is among the best I have seen in recent theatre outings. The play is performed without intermission. As the Fountain’s artistic director Stephen Sachs says, “It’s a beautiful play that perfectly folds into our mission of diversity and inclusion…. At the same time, its themes are profoundly universal, illuminating the human condition.” It has won several prizes in addition to the Pulitzer, and was named one of the “Best Plays of 2017” by The New York Times. At first glance, the gray and black set design by Tom Buderwitz seems plain and simple enough—a mostly vacant living space with a few odd cartons and baskets indicating people moving in or out. They also contain some props for later use. But at a couple of key points, walls slide open and other environments appear. 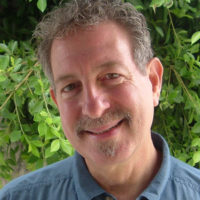 Other members of the production team include lighting designer John Garofalo, sound designer Jeff Polunas, costume designer Shon LeBlanc and prop master/set dresser Terri Roberts. Cost of Living runs through Dec. 16, with performances on Fri. at 8 pm, Sat. at 2 and 8 pm, Sun. at 2 pm, and Mon. at 8 pm. Pay-What-You-Want seating is available every Mon. night in addition to regular seating (subject to availability). The Fountain Theatre is located at 5060 Fountain Ave. (at Normandie) in Los Angeles 90029. Secure, on-site parking is available for $5. For reservations and information, call (323) 663-1525 or go to the Fountain website. The Fountain deserves a big, colorful bouquet for this one. Catch it if you can.